Isla Mujeres. That little gem off the coast of Cancun lying peacefully in the Caribbean Sea, waving you over to experience her magic. “Magic” is precisely how you will hear islanders and visitors alike describe her. Mystical, healing, and rejuvenating are also words which have been associated with the island. Until you go, you’ll never find out for yourself. Although there are many activities and sights to experience, there are seven that always stand out. Once you build on these, you’ll begin discovering how she is indeed magical. If you are visiting Isla for only one day, you’ll not be able to enjoy all seven. (Those that can be done in a day are indicated with an asterisk.) So plan on three to four days and nights… and remember to ask if you can extend your stay — everyone does. 1. * Punta Sur. Rent a golf cart and enjoy a breathtaking drive along the Caribbean side of the island. At land’s end you’ll arrive at Acantilado at Punta Sur. 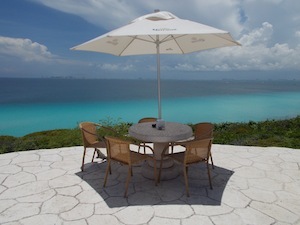 Take a very short walk onto the outdoor patio, where you’ll find a half-dozen tables adorned with beach umbrellas. Take your camera out and have a seat. From here you can see the entire coastline of Cancun, which makes for an outrageous backdrop for some incredible photographs. You’ll be greeted by a waiter who will gladly provide you with cold, sparkling adult beverages and a menu. Tip: If you’re hungry and ready to taste the freshest, most succulent Caribbean lobster on the planet, order it. While you’re in awe of what your eyes are taking in, do not forget to take photos. By the way, many banks will allow you to upload a photo to be placed on your credit or debit card. What a great way to forever remember, create envy, and plan for your return trip. Once sufficiently hydrated and stuffed, take yourself back to Centro, again via the Caribbean Highway. This time, it will look even more beautiful as the sun now makes the water even more colorful than before. It will also feel more familiar, thus allowing you to see more of what you may have missed. Once back in Centro, head over to Playa Norte and park your cart in the powder-white sand next to Buho’s. Grab your towel and just start walking. You’ll find your mind knows exactly where it wants to go. Pick out a nice plot of earth — in the open or under an inviting palm tree. Then. Just. Sit. Your goal here, besides telling yourself, “It doesn’t get — it can’t get — any better than this” (I promise you, it can, and it does), is to be present for the most magnificent sunset you will ever witness. People come from all corners of the globe just to see what can only be seen to be believed. Once the sun sets below the horizon, return your golf cart and make your way to the ferry, where your mind will reel with thoughts of how you wish you could have stayed longer and that next year, you will. 2. Swim with the whale sharks. Professional photographers traverse the continent to be in the water capturing the most brilliant, breathtaking photos of these giants of nature. If you’re a thrill-seeker — NOT a danger-seeker — or an adrenaline junkie, this is the one for you. Parachuting? Downhill speed skiing? Drag racing? Nope. And not even close. When there’s a 10-ton fish with a mouth that could literally swallow a smart car swimming inches from you, that kind of flirtatious interaction is the ultimate rush. You and your little mask, fins, and snorkel are in the middle of the Caribbean Sea, triangulated between Cancun, Isla, and Cuba, bobbing around like a cork while these monolithic creatures of the sea pay you zero attention. Now, if your name happens to be Plankton, on the other hand, you may have a problem. There are a number of qualified, highly professional, and totally safe dive adventure shops on Isla. The typical price to enjoy this unforgettable, unbelievable adventure is around US$200. It’s about a half-day trip, leaving in the morning. After your excursion, you will be served freshly prepared ceviche from fish caught that morning. The stories you’ll share with your friends and fellow “divers” will be mind-blowing. 3. * Current snorkeling. For about US$60 to US$80, the same companies that offer whale shark excursions can also take you on a half-day exploration of the outer waters of Isla, morning or afternoon departures. If you don’t have your own snorkel gear, they’ll even rent it to you. Everything you’ll see is no more than 50 feet deep. You begin with a leisurely walk from your dive master’s location with your guide making your way to the docks where your captain, first mate, and vessel await. Once introductions and safety checks have been covered, everyone finds a seat. THIS is, by far, the best way to enjoy the beauty of Isla from the water. 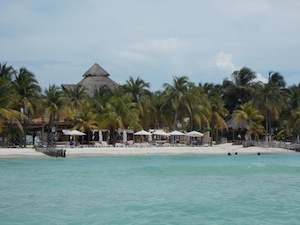 Your guide will typically take you to Manchones Reef, Musa Isla Mujeres (a.k.a. the Underwater Museum), and the Lighthouse reef. The Lighthouse reef is incredible as you literally do no more than float with the current while you are amazed at the water temperature and clarity allowing you to relax and enjoy seeing the most brilliantly-colored fish, barracuda, lobster, and starfish. Tip: Buy a $25 disposable underwater camera and bring back photos that will have people shaking their heads in amazement. After your snorkeling adventure, you’ll typically enjoy a leisurely cruise around the entire island accompanied by an authentic Caribbean or Mexican lunch before your safe return.